The castle, the river and the old bridge compose the picturesque city image of Heidelberg, which could not have been captured more beautiful by an artist. Germany`s vibrant student city radiates cosmopolitan spirit paired with romantic small town flair. Above all, resides one of the most beautiful ruins of the world. 24 Hours in Heidelberg – The city of poets & thinkers to lose your heart. About 12 million visitors from around the world flock to the German city of Heidelberg each year, which is located only 50 miles south of Frankfurt. The first stop for many tourists is literally breathtaking. More than 300 stairs lead up to the “Heidelberg Castle”, but it is worth every single step! One of the most beautiful ruins in the world unveils scenic views over the old town and the surrounding valley. “I lost my heart in Heidelberg” is the name of an old German song that has turned into a theme, which every first time visitor will understand with a view of the castle & the old bridge nestled against the backdrop of a romantic countryside. Painters, writers and poets fell for the charm of the idyllic city at the Neckar River. 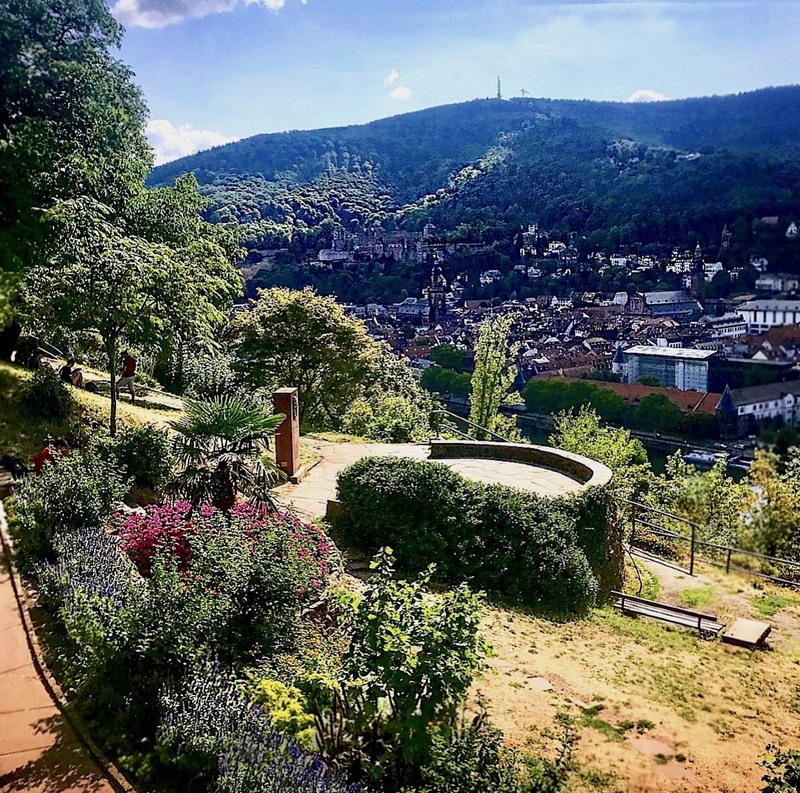 Mark Twain gushed about Heidelberg that the city was “the last possibility of the beautiful” and “Germany in the summer is the perfection of the beautiful”. Today, you can still feel the flair of the country of poets and thinkers in the old streets of Heidelberg, where famous German romanticists like Eichendorff spent their study years. The Country of Poets and Thinkers. From left to right: “Heiliggeistkirche”, an artist at “Hauptsraße” and “Haus zum Ritter”. Despite its ancient landmarks, Heidelberg bursts with vibrancy. Home to the oldest University in Germany, the student city is remarkably young with around 40% of its population under the age of 30. Life is bustling in the countless restaurants, cafés & bars of the old town. In the main street, “Hauptstrasse”, crowds of tourists are flocking through Germany`s longest pedestrian zone and the sound of English, Italian and Japanese echoes between old cobblestones. The cosmopolitan spirit of Heidelberg is enhanced by its diverse population. As a renowned hub for researchers, every third resident is estimated to be international, many of whom are scientists and students from abroad. The “Studentenkarzer” located at “Augustinergasse”, used to serve as a prison for students in Heidelberg from 1823 -1914. Because of misdemeanour, students had to spend up to 4 weeks in the chambers. The arrest was sometimes used to skip lectures and paint the walls with poems & pictures that have turned into a museum attraction today. Wall paintings in the “Studentenkarzer”, which served as a prison for students in Heidelberg. One of the most remarkable institutions of Heidelberg`s tradition-steeped student culture is the restaurant “Zum Roten Ochsen”. If you walk through the heavy, old door, you enter a historic world: Engraved wooden tables, old pictures, drinking horns and jugs are telling the stories of the 300 year old institution and its guests. It feels like the spirit of the students that encarved the rustic wood is still alive, just like the zest for life that has always characterized the university city. The family owned restaurant, where you can enjoy hearty meals like “Ochsenbrust” (brisket of beef) and the national dish “Schwäbische Maultaschen” (Swabian raviolis), has always been a place of welcome for visitors from around the globe! It feels like the spirit of the students that engraved the rustic wood is still alive. Historic Restaurant “Zum Roten Ochsen” with ancient relicts and rustic tables engraved by students. If you want to find original treasure troves like the “Heidelberger Zuckerladen” (candyshop) you have to walk to the “Plöck”. The parallel street of the “Hauptstraße” is lined with local, family owned businesses & antiquarian bookshops, conveying a rare feeling of deceleration. In Heidelberg`s most famous candy shop, Jürgen & Marion have sweetened the days of their customers with heart & humor since 30 years. The long-established “Zuckerladen” is stacked from floor to ceiling with candys and nostalgic souvenirs. Locals and tourists are tightly packed in the small shop, but time is taken for each customer with a small chat & gamble, which makes a visit to the “Heidelberger Zuckerladen” a one of a kind experience! The shopwindow of “Heidelberger Zuckerladen” decorated with notes from customers and a dentist chair. Antiquarian Bookshop at the “Plöck”. At the beginning of the 19th century, many writers & poets resided in Heidelberg that spurred a literary genre named “Heidelberger Romantik”. Heidelberg is the most beautiful city in the world! “Neuenheim”is one of the Heidelberg`s most attractive neighborhoods. The diverse community located across the Neckar River is a place where traditional handcraft meets the hip creativity of a new generation. The popular Café Nomad has opened a vibrant, new location in the quarter, which is my favourite coffe shop in the city! Here, you can start your day in friendly atmosphere with barista style coffee, pretty bowls & healthy breakfast variations that attract the attention of the one or other passersby. At the end of the day, one landmark is still missing on my list: Heidelberg`s famous “Philosopher`s Walk”. Students were the first ones to discover the scenic views of the path, that begins in the district of “Neuenheim”. Steep slopes lead up to the “Eichendorff-Anlage”, named after the famous German poet Joseph von Eichendorff. On beautiful days, school classes are sketching the panorama of Heidelberg`s famous landmarks that has fascinated onlookers since centuries. “Eichendorff Anlage” at the “Philosopher`s Walk” with a panoramic view over the Neckar valley. I leave Heidelberg as the sun is setting and the castle & old bridge are plunged into warm light. In the summertime, life centers around the river, where crowds of young people relax at the “Neckarwiese”. A beautiful day in the city is ending with sunbaths & barbecues. “I lost my heart in Heidelberg” is all I felt in this moment – like many poets, writers and visitors before me. Posted in Travel and tagged Europe, Germany, heidelberg, philosophers walk, Travel Tips, travels. Bookmark the permalink.